The original Drifters, 4455 Mark Dabling has a new sister location at 1485 Jamboree Drive near the Chapel Hills Mall. Owner Richard Beaven spent months refurbishing the former taco joint. CLAIM TO FAME: Locals love Drifters’ award-winning California-style burgers and shakes along with breakfast burritos made with real eggs — food that’s affordable and fast and features quality ingredients like Callicrate Beef. 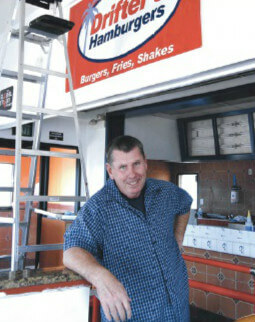 “Our motto is ‘restoring the reputation of the fast food hamburger’,” says owner Richard Beaven. THE SCOOP: It’s been four years since Richard Beaven opened his first Drifters location, and he’s been interested in expanding to the Chapel Hills Mall area ever since. He also has his eye on the city’s south side. And he’s offering franchise opportunities nationwide.